"Modi Photo On Calendars And Diaries Of State-Run KVIC", So What??? Home Politics “Modi Photo On Calendars And Diaries Of State-Run KVIC”, So What??? 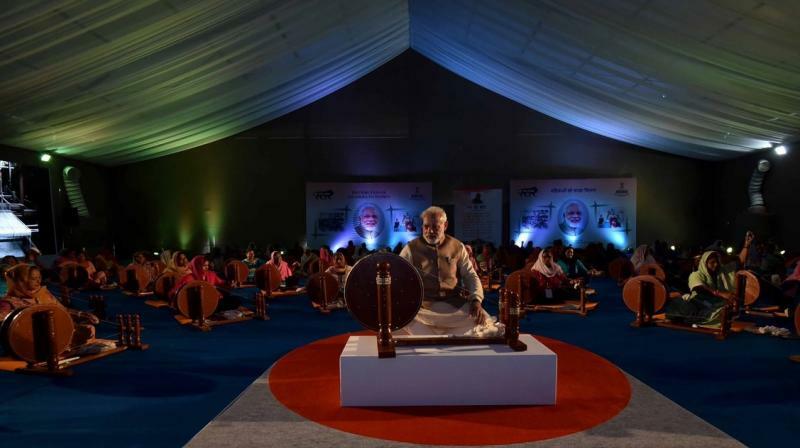 Although there is nothing wrong if a picture of a Prime Minister of India is associated with a charkha and the country’s Khadi Udyog, but it snowballed into a major debating point with lots of mud slinging across social media platforms. “Narendra Modi is a “better brand” than Mahatma Gandhi whose image did not help khadi and led to devaluation of Indian currency” said Haryana Minister Anil Vij, drawing widespread criticism, with Rahul Gandhi using the comments to attack the Prime Minister, saying even dictators like Hitler and Mussolini were powerful brands. “Gandhiji’s name has no patent over Khadi. Since Gandhi’s name has been attached with Khadi, it has only gone down. When Gandhi’s image was put on notes, the currency also got devalued,” Vij said. Anil Vij was responding to the controversy over Modi’s photo on the calendars and diaries brought out by Khadi and Village Industries Commission (KVIC) for this year. “It is a good move to replace Gandhi’s image with Modi. Modi is a better brand than Gandhi. With the Modi brand name, Khadi sales increased,” Vij told reporters in Ambala, which he represents in the state assembly. Congress vice president Rahul Gandhi assailed Vij for his remarks, which he promptly lapped up to target Modi, whom Congress has been accusing of being autocratic. “Hitler and Mussolini were also very powerful brands,” Rahul said in a tweet. The Congress’s media cell chief Randeep Surjewala reacted strongly to the Haryana minister’s remark, saying Gandhi “can be killed, his photographs can be removed but he remains in the soul of India”. The “insulting” remarks by Vij were slammed by Tushar Gandhi, Mahatma Gandhi’s great-grandson, who alleged it was part of a “well orchestrated” campaign by the the “high command” and the minister was speaking the language of RSS. “Subjugate people and institutions and use the power of the state to stifle every dissenting voice. But Modiji, Anil Vij and BJP must remember that Mahatma Gandhi…you can kill him, you can remove his photograph, you can abuse Mahatma Gandhi, but Gandhi has always lived in the soul of India,” Surjewala said. “Bapu gave us our freedom. Is the minister not ashamed for using such words for Gandhiji?” he said. An embarrassed BJP quickly went into damage control, distancing itself from Vij’s remark and condemning it. “We condemn these remarks. These are his personal comments,” BJP spokesperson Shrikant Sharma said. Haryana Chief Minister Manohar Lal Khattar, who had pipped Vij at the post for the top job after BJP’s maiden triumph in the assembly elections in the state, said the remarks made by the Minister were in his personal capacity and the party does not endorse them. Roundly assailed, Vij later withdrew his remarks. “The statement given by me in connection with Mahatma Gandhi was given in my personal capacity. To avoid hurting anyone’s sentiments, I am withdrawing it,” the Minister tweeted. Modi’s photographs on the calendars and diaries of state-run KVIC has kicked up a row, with opposition parties slamming the development, but the government and BJP have dismissed the controversy as “unnecessary”. KVIC chairman V K Saxena had yesterday defended the move, saying there is “no rule or tradition” that only Mahatma Gandhi’s picture can be published on these items.